South Jakarta Water Resources (SDA) Sub-department builds four infiltration wells in three locations. Each infiltration well is built by 10 South Jakarta SDA Sub-department personnel.
" 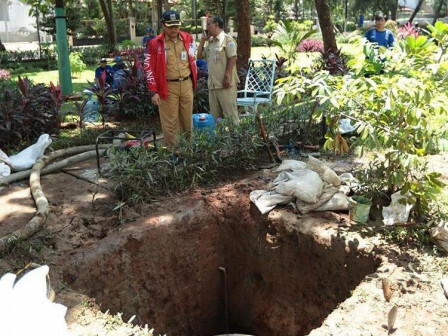 Each infiltration well has depth four meters and diameter 1.5 meters"
South Jakarta SDA Sub-department Head, Holi Susanto conveyed, two of four infiltration wells are placed near Canadianty Pump House, Mampang Prapatan Sub-district. "We build two infiltration wells in this location because it has good soil contour," he said, Tuesday (2/12). One infiltration well is also build in pump house on Jalan Kemang Timur 1, Pancoran Sub-district, and the other in pump house on Jalan Kemang Timur II, Mampang Prapatan Sub-district. "Each infiltration well has depth four meters and diameter 1.5 meters," he informed.